Professor Karen Spärck Jones is one of the pivotal figures in the history of the development of the search engine as we know it today. 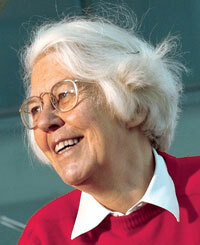 In 1972 she published the paper "A statistical interpretation of term specificity and its application in retrieval" which introduced the concept of 'inverse document frequency'. This is a major component of ranking algorithms to automatically retrieve text from an index of documents. Although in 1972 it was just a statistical theory, in 1994 it was the theory that Mike Burrows used to originate Alta Vista. I had the pleasure of meeting Professor Spärck Jones at the Infonortics Search Engine meeting in Den Haag in 2004. She gave the keynote speech at the conference, with an unassuming set of plain text slides bemoaning that her entire life's work seemed to have culminated in millions of people typing "Britney Spears" into Google. "The reality of search and the intersection of intelligent search systems with human invention were aptly illustrated on the second day of the conference between Jones and Martin Belam from the U.K.'s BBCi Search. This dynamic, plus the juxtaposition of intelligent indexing and auto-categorization research with the reality of Web searching, were major themes of this meeting. In his session 'Human Intervention in the Search Process,' Belam described BBCi's Best Links, a program in which a team constantly reviews and adjusts search queries so that results match customers' expectations. For instance, when the space shuttle Columbia was in the news, the increase in the number of searches for 'Colombia' did not indicate a spike in interest about the South American country, but rather a common misspelling. BBCi adjusted its directory during that period so that searches on 'Colombia' returned hits about the space shuttle disaster. During the break following Belam's presentation, he and Jones discussed the why's and why nots of machine indexing and building directories based on human results monitoring. Jones offered assistance from the research community in automating the Best Links project. Research intersected with the real world as Jones scratched boxes and terms on the back of her conference notes, while Belam allowed that some of BBCi's monitoring might be automated." "We were trying to get at girls in schools [to take up computing] and we knew we had to get to the teachers first. We found that the spread of computing in the administrative and secretarial world has completely devalued it. When one of the teachers suggested to the parents of one girl that perhaps she should go into computing the parents said: 'Oh we don't want Samantha just to be a secretary'. That's nothing to do with nerdiness, but the fact that it's such a routine thing." "It's hard work to produce a good spreadsheet package, but if people only learn how to use them, and not what's behind them, we're missing a trick." "I think women bring a different perspective to computing, they are more thoughtful and less inclined to go straight for technical fixes. My belief is that, intellectually, computer science is fascinating - you're trying to make things that don't exist. In that respect it's like engineering, trying to build new things. Take skyscrapers - they had never existed and provided fundamental engineering challenges - weight, windforce and so on. We need women to see the intellectual challenges and social importance of computing, all of the things that computer systems are used for now and why it matters to society." Professor Spärck Jones was passionately concerned with the practical application of computing in society - and in making sure that people took an interest in the way that it impacted upon their lives. "ID cards are a very good example of this. It's a fundamental notion - it will cause a person as a legal entity to have a particular definition. Think about the implications of CCTV, another example, or health and education. Should we do all of our teaching via IT? What's the function of education - can this be achieved with IT? What about climate change and sustainability? Think about the fact that most women drive - traffic modelling is a growing area? What is it? How should it be factored in charging for where you go, convenience of route and so on? All these things are part of the fabric of one's life. So I've always felt that once you see how important computing is for life you can't just leave it as a blank box and assume that somebody reasonably competent and relatively benign will do something right with it." I have to say in retrospect that I did not fully appreciate at the time what an honour it was to meet her - or indeed how much impact she had inadvertently had on my life. It was through working on search engines that in 2000 I moved out of record retail and into full time work on the world wide web at the BBC. And it was through Professor Jones work on information retrieval in the 1970s that the web ended up with the search engine technologies that we have today. I wish I'd said "Thank you"
This blog post has been written to celebrate Ada Lovelace Day, "an international day of blogging to draw attention to women excelling in technology". You can find more blog posts at the Ada Lovelace Day Collection. By Martin Belam on 24 March 2009.